Congratulations to our seniors who have signed letters of intent to be collegiate athletes next year! 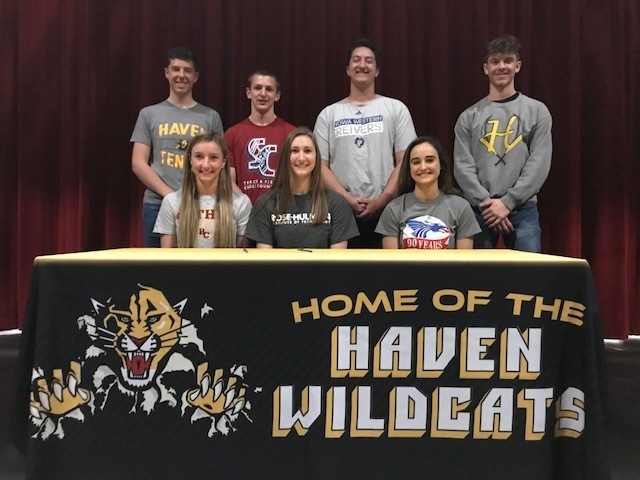 Nathan Wells will play tennis at Sterling College; Quinton Miller will run cross country and track at Sterling College; Ryan Williams will play football at Iowa Western CC; Corey Smith will play football at Ottawa University; Julie Wilhite will play volleyball at Bethel College; Jordan Barlow will play basketball at Rose-Hulman Institute of Technology; Emily Weaver will run track at Hutchinson CC. We are proud of all your accomplishments, and wish you the best in your future endeavors! Go Cats!